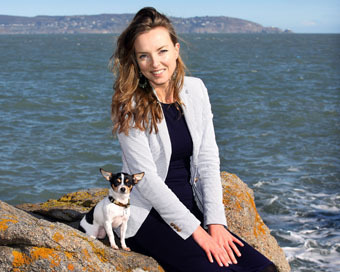 In the hot seat for May’s Women Who Launch is Barbara Hanly, Soopa Pets. Our mission is to help pet owners treat their pet’s guilt free by creating healthy, innovative and tasty pet snacks. Our office is located in Sandyford, Dublin and our team includes me (founder), Claire (sales and admin), Janet (UK sales manager) and of course Lily our small office dog with the big personality! We look forward to expanding our pack in the coming months in areas of sales, marketing and administration. We were delighted recently to announce securing a funding round of €400,000 which was led by business angels from the HBAN Food Syndicate and with support from Enterprise Ireland. This investment will help develop even more innovative and exciting products, build a strong support team and a fast expanding international business. Prior to investment the business was self funded and all profits re-invested. Our target market are pet owners that are passionate about their own health and food choices and want the same to be available for their pets. We love brands and companies that are passionate about the same things we are including health, nutrition, animal welfare and our planet. Companies such as Pukka, Deliciously Ella and Wholefoods motivate and inspire us. US health store king Wholefoods taking our little brand on board. We also recently launched into the UK’s largest pet store chain Pets at Home which was pretty pawsome! I would say I’ve experienced plenty of disappointments along the way but you learn to dust yourself off and never get too excited about a potential deal until you have a signature on the dotted line. Soopa has generated a buzz thanks to features in Glamour magazine and ITV This Morning, recommendations through healthy pet food focused blogs, Facebook and twitter. Our customers and retailers are our real brand ambassadors because they know we are super passionate about pets and their well being is our priority. Innovation is key and helps sets us apart from our competitors. Be the innocent of pet foods – why not?! – Market our products to every dog on the planet! Tony Robbins again as his energy to make things happen is infectious and he’s super ambitious. Always trust your gut, it’s never wrong.